A king pin kit with a Torrington needle bearing is a completely hidden old-time upgrade for your old-time car. You can install one of these kits and no one will know that your old car's king pins have been upgraded. However, you will know because the car should steer better and the king pins should last longer. The Torrington Co. of Torrington, Conn., started as the Excelsior Needle Co., a firm that used a "cold swaging" technique to create sewing machine needles and other needles from cold metal. During the Great Depression a Torrington engineer named Edward K. Brown developed a new type of bearing with needles in it that became one of the company's biggest selling products. Thanks to Brown's creation, Torrington became a leading manufacturer of anti-friction bearings and one of its automotive products was part of an upgrade kit for king pins that replaced the upper bushing in a steering knuckle with a Torrington needle bearing. The upper bushing had always been very prone to wear and the Torrington kits helped solve that problem for as long as cars used king pins. Torrington still exists. In the 1960s, the company was purchased by industrial giant Ingersoll-Rand and in 2003 it was sold to the Timken Bearing Co. The Torrington needle bearings came in a kit that included the bearing, a lower bushing with a bearing oil hole, king pins, the Torrington needle bearing, Welch plugs and a staking pin. To install the needle bearing in the upper end of the steering knuckle, you have to make a tool used to drive the bearing into the top of the steering knuckle. At the bottom, the king pin fits into a regular bushing. You start this installation by thoroughly cleaning up the steering knuckle. Make sure that the grease holes in the steering knuckle are super clean. You do not want to be pushing dirt into the grease hole when you grease the bearing. Figure 01. To install the king pin kit with the Torrington Needle Bearing upgrade you will have to make this simple tool. Figure 02. The tool positioned through the bearing in the upper end of the steering knuckle with the pilot end inserted in the lower bushing. Figure 3. 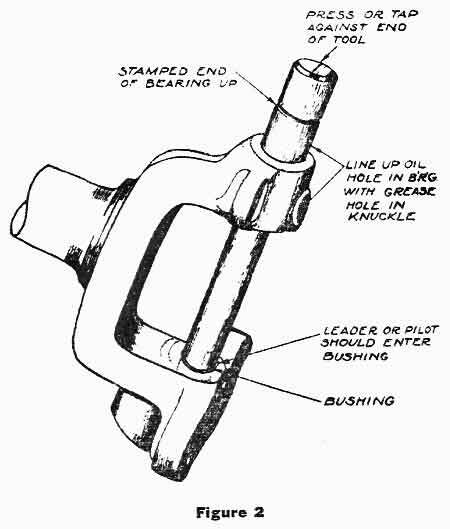 The tool has to drive the needle bearing into the position shown here so the bearing oil hole lines up with the grease hole in the steering knuckle. Next, install the bushing in the lower end of the steering knuckle. Figure 2 shows how the bushing should look when installed. 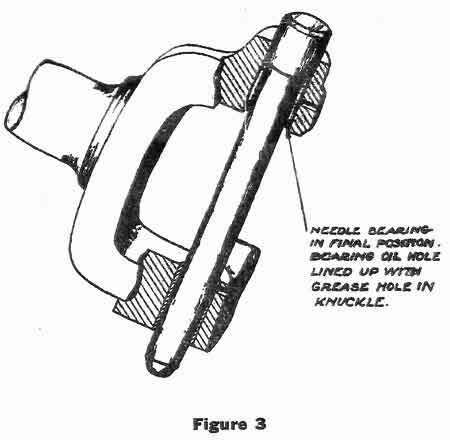 Figure 3 shows a cross sectional view of the steering knuckle with the bushing in place. 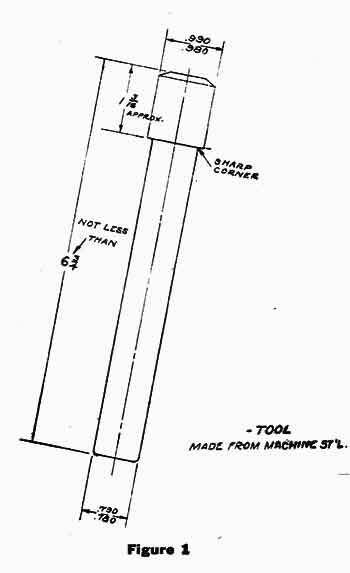 Now it's time to make a tool similar to the one shown in Figure 1. This is fabricated from machine steel. The leader or pilot end has to enter the bushing, as shown in Figure 2. Overall, the tool should be not less than 6-3/4 inches long. The bottom should have a .780-.790 inch diameter. The top section of the tool is slightly wider. It has a .980-.990 inch diameter and should be approximately 1-3/16 inches long. Note this measurement and sharp corner shown in Figure 1. Cleanliness is very important because you don't want a dirty friction bearing "machining" the steering yoke for you as you drive. So, the next stop is to clean your arbor press and your workbench. When the press and the work area are super clean, remove the bearing from its wrapper. Do not wipe lubricating grease off the outside of the bearing and do not clean the inside with a rag. Place the bearing in the lower section of the steering knuckle. Be certain that the stamped end is facing upwards. Then, line up the oil hole with the grease hole that the factory drilled in the steering knuckle casting. Clean the bearing installation tool you made and place it through the bearing as shown in Figure 2. The wider upper section of the tool will not go through the needle bearing. It will push the needle bearing in. Make sure that the pilot end enters the lower bearing. After installing the new king pin in the steering knuckle, install the grease fitting in the grease hole that the factory drilled in the steering knuckle. Use a clean grease gun filled with clean, light grease to lubricate the needle bearing. We purchased our king pin kit with the Torrington Needle Bearing upgrade from Northwestern Auto Supply in Grand Rapids, Mich. This is one of the many hobby companies that sell new old replacement stock parts for vintage cars. Like all such suppliers, the availability of obsolete parts depends on the inventory they have on hand. To find a Torrington kit for your car, check for ads from such suppliers or look for vendors who sell suspension and steering parts at the next swap meet you are attend.